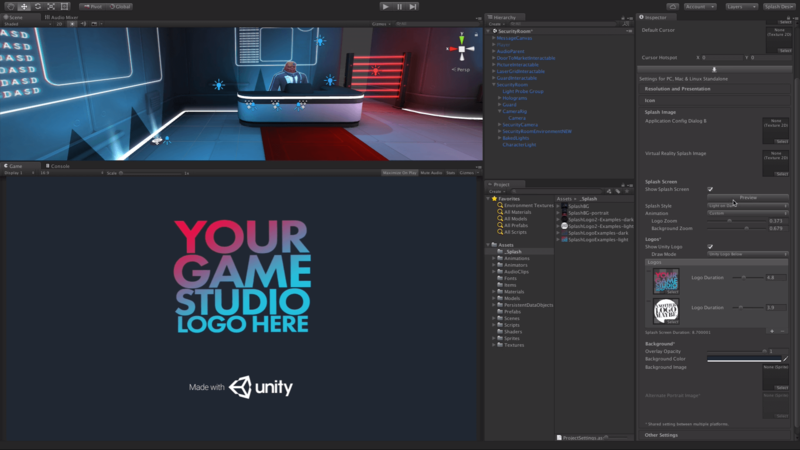 While hardly the most exciting thing to join Unity’s toolbox, I have a feeling there are still plenty out there who are more than a little eager to customize the splash screen of their project. This one’s for them. Shame that most people go out of their way to skip said screens, but ah well, what can ya do? Make a truly great looking display of art in it, that’s what! Create something no player will want to skip, something that might even contain hidden hints or some such. Depending on the type of game of course. But you get the gist, I’m sure. Whether fade, rotate, spin out of control or something else entirely is your idea of a proper splash, chances are you’ll be able to find it in the Unity Splash screen tools – beta or not. We wanted to get the splash screen out early so we can get feedback which means there is still some work to do during the beta period and a few unresolved issues. Not a plus / pro user? Don’t worry – just means there’ll be this little ‘Made With Unity’ co-branding somewhere in your design. Oh right, you do have to use Unity 5.5.0 – which is also in beta – to access this latest addition. Just something to keep in mind, before you dive into the latest stable release, hoping to… make a splash.